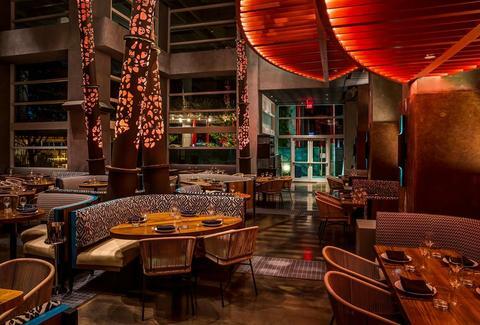 KOMODO is an Asian restaurant located in the beautiful Brickell Avenue, Downtown Miami. My friends and I had dinner here, and being my first time there, I was fascinated by the stylish décor and swanky vibe that this place had to offer. The restaurant is spread across three levels that has indoor and outdoor seating. The lighting was perfect against the dark wood, dimmed low with shades of red and orange which gave the South East Asian warm feel, yet we were dining under palm trees which mixed in the Florida atmosphere so well. We went there on a Saturday evening, and it was pretty busy. The main bar area had a great buzz, and the restaurant had many groups of people enjoying their time there. Despite it being busy, the waiters done a great job at looking after us and being efficient, which was great. KOMODO has a hand-crafted cocktail selection ($17 each) which all looked divine. I tried the Ginger Passion Fruit Mule which was delicious. It was topped up with sparkling sake (yum). There is also a great wine selection, as well as beers. Having looked at the KOMODO Instagram page, I learned that it is a popular spot amongst the celebrities. It is open till late and has great food, so its not hard to tell why. The small plates are delicious and healthy, but one of the highlights is the desserts! I was recommended to try the crispy peking duck which was scrumptious ($98) , and also tried the Wagyu Skirt Steak Tacos, Grilled Shishito Peppers, Miso Seabass Skewers, Vegetable fried rice and the Garlic King Crab Lo Mein. This was a lot of food for just the three of us, so we took some away with us. Regretably, I was too full to dig into dessert. My friends shared the Five-Spice S’more. To me it looked like the perfect children’s dessert , but to my surprise it is loved by adults. It consisted of a valrhona chocolate cake, smothered with melted marshmallow, with graham cracker ice cream. The whole dessert menu looked fun and not your usual. I chose to have a scoop of mango sorbet to supress my sweet craving.